When cupid's arrow strikes on topics of the heart, the first thing that comes to my mind is self-love. This is due to my long and complicated personal journey of self-love. Family stories, life experience, and personality all play into our natural ability to love ourselves. And for many of us, it can be a long road to hoe. That's why I almost fell over when I saw the message that my daughter scribed for herself when I went into her room this morning. 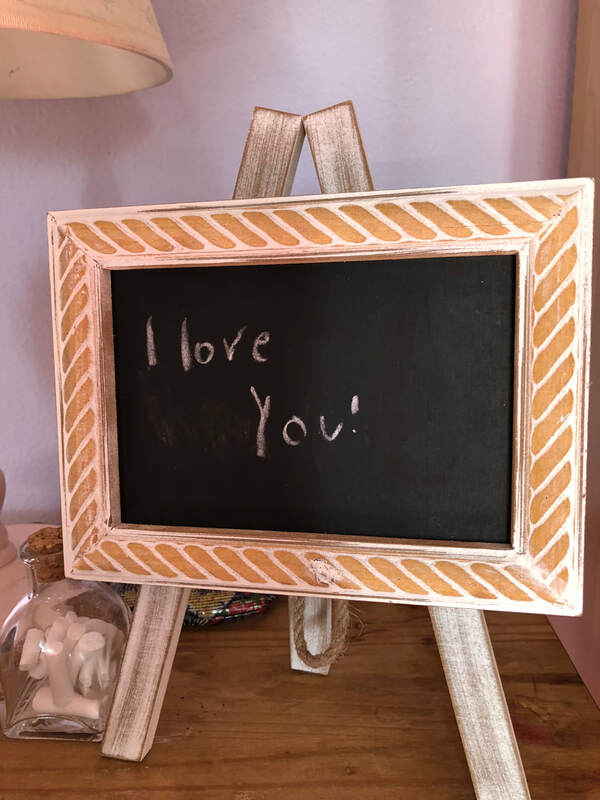 On her chalkboard, were the words: I love you! It was the best Valentine's Day present this mother could ever hope for. Over the years, I've learned various methods of practicing self-love. One of the more challenging techniques is every time I pass a mirror, looking at myself and saying "I love you." (Another practice is avoiding mirrors altogether ;) Yoga and Ayurveda explain this road to self-love as part of our karmic journey. If there was an iota of ripple effect in my journey, all the awkwardness of learning to love myself has paid off in spades with this one note by my daughter. May we all take one small or big action toward more self-love today.